All Sherwood homes currently listed for sale in Sherwood as of 04/24/2019 are shown below. You can change the search criteria at any time by pressing the 'Change Search' button below. If you have any questions or you would like more information about any Sherwood homes for sale or other Sherwood real estate, please contact us and one of our knowledgeable Sherwood REALTORS® would be pleased to assist you. "Premier Parrett Mountain Location. 5 Snow Capped Mountain Views. Enter Gates to Honahlee Down a Long Cherry Blossom Drive. Rail Fencing, Expansive Paddocks, Plant 30 Acre Vineyard of Pinot Noir in Jory Soils. Equestrian Facility w/ Outdoor Arena. Landmark Estate Home & Guest Apartment Designed by Green Gables/Michael Schultz Landscape. Grounds Provide Inground Pool and Spa, Extensive Patios, Lawns & Gardens. 25 Min to Downtown Portland"
"Iconic Sherwood Forest Equestrian Center Exemplifies what Oregon Horse Country has to Offer! Majestic 120+acres Encompass Mt Hood Views, Wooded trails and Rolling Pastures. Long established boarding/training facility equipped with 55+ stalls, 100x220 Indoor Arena, 150x300 Outdoor with 30+ turnouts. Just 5 miles to I-5 in the heart of desirable Sherwood. All the accouterments one would expect. Cute Farmhouse & new single level home." "Plant Nursery with Home, Green Houses, barns, office, field stock, container stock areas and Irrigation Water Rights. Convenient to I-5, Wilsonville, Tualatin and Sherwood. Currently in the Basalt Creek Concept Plan Area in the UGB, FD20; Appointment Only." "Dreaming of planting your own VINEYARD? 57 Acres of PRIME FARMLAND~Original Family from 1890 Homestead. 1926 Farmhouse Bungalow has period details & builtins. Value is in the land. EFU Zoning w/house & 6 other buildings. 1912 Barn still solid! County says can add Winery, Tasting Room, Food Assoc w/Winery. Buyers to do their own due diligence. Can sell 19.77 AC parcel separately. See MLS 18108596 Owned by same family 128 years." "Magnificent Hilltop Estate on 5 Acres in Wine Country! State of the Art Custom Finishes & Open Beamed Lofty Ceilings. Approx 5000 SF on Main Level with Full Wheelchair Access. Gated Circular Private Drive. Copper Gutters. 2085 SF Guest House. 2nd Drive Leads to 5000 SF Heated Shop with 15 Car Garage. 60' Garage for Class A Motorhome. Office Space Suitable for In-Home Business. Mountain Views from Covered Porch! For the Car Enthusiast!" "Amazing 7,670sf estate on 35 acre w/2,400 sf, single-level attached guest house and 5,000sf shop.Approx 12 plantable acres.Main house w/4 bd,media rm,bonus rm,wine cellar, gym, 3 offices,sauna.Gourmet kitchen w/granite & stainless.Entertainers dining rm w/huge butlers pantry.2 staircases.Amazing valley views! !Private pool.Guest house w/master suite,kit,add bed&bath,office,separate entry & garage.Business lease potential for shop $5k/mo." "Contemporary country estate on 5.81 acres fenced & gated offers privacy, luxury & tranquility. Custom designed & built by St of Dreams duo. 2 story foyer, Great Rm w/floor to ceiling windows, trayed ceiling, cove lighting. Fantastic kitchen w/nearly every convenience built in. Master suite & 2nd bedrm suite on main floor. 2 en suite bedrms, loft & bonus rm upstairs. Original farmhouse remains on property w/horse stable & corral." "Do not enter property without appointment. 10.47 Developable Acres in Brookman Rd concept plan area. Sherwood City Council just approved this area to be annexed into the city of Sherwood. City is finishing up paperwork with State and Metro. Buyer to do due diligence." "Luxurious mountain retreat with gorgeous mountain & valley views! Gated entrance & 4.12 serene acres of grounds to enjoy. Pool, hot tub, sauna, gardens, large shop with space for an RV - this home has it all! Inside you will find warm & inviting, yet open rooms. Main level master suite with private sauna & exercise room. Vaulted beamed ceilings, hardwoods, built-ins & more. No detail was overlooked in this custom & quality-built estate!" 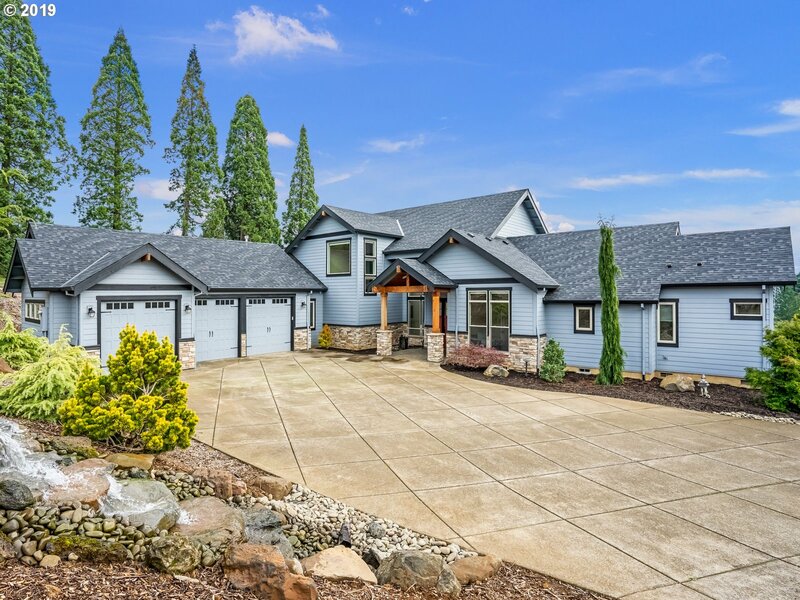 "Classic Mascord craftsman for entertaining & comfort, Pacific NW country living at its best.From the inviting covered front courtyard to the spacious great rm with pine ceilings overlooking tile covered deck and view of the hills. Eastern boundary is an inactive, abandoned R x R line. North prop line on Hells Canyon Rd room for barn & pasture. Its love at 1st sight." "Enjoy the view before entering the front door and be captivated by the 3 Mt. view as you stroll to the wall of glass that makes the outdoors a part of your home. A contemporary home designed for comfortable living and entertaining. This executive family home to built to the highest standards will be one of the best in a private gated community of grand homes on large lots surrounded by protected green space. 20 Wineries w/in 15 miles." "Ideal location,combines both picturesque landscapes & convenience.Timeless 3 bed,3 bath 3,126sqft home offers open concept,vaulted ceilings,gum wood floors,radiant heat & plenty of light.Main level master showcases soak tub, walk-in closet.Over 25 acres of gentle topography,relax in your hot tub and listen to your horses in the pastures.Main barn w/30 stalls directly connects to 60X200 indoor arena.Serene 100X200 outdoor with roundpen." 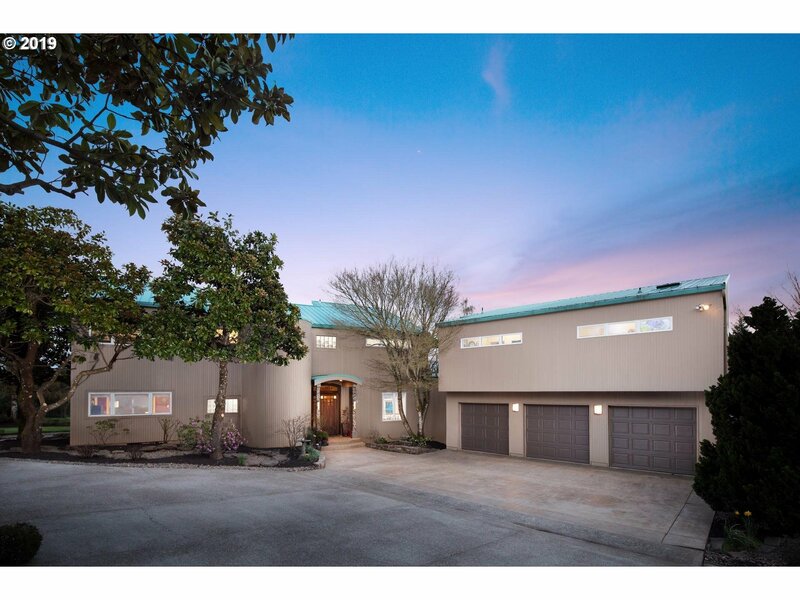 "Drive thru the main gate to this secluded/remodeled 3225 SF home w/hardwood floors,state of the art gourmet kitchen w/quartz counters, pantry any chef would love, huge master walk-in closet made for the Kardashians, all on 39.69 acres w/lots of options.Lounge on the huge deck admiring your Mt Hood view, watch the wildlife strolling the acreage & walk down to the river for some summertime fun. 100+acre wildlife refuge as a neighbor!" "Rare Close in Lake Front Acreage in Gated Community of 12 Homes. 4+ Acre Lake and 20+ Acres of Wooded Trails. Custom Country Residence Provides Gourmet Kitchen w/ Spectacular Indoor/Outdoor Spaces For Entertaining in Style. 16 Car Shop/Garage Space for the Auto Enthusiast, 3 -12 Garage Doors. Plus Additional 2200 SF of Heated Shop Space Below Home. 20 Min to Downtown Portland/10 Min to Bridgeport Mall. 5 Min to Coffee." 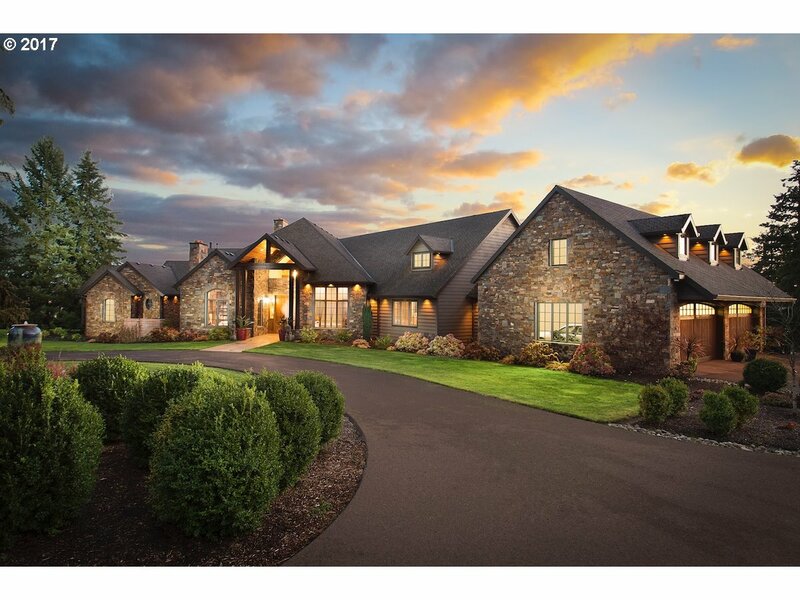 "This home offers everything for living the true Oregon experience! Over 6 acres with 5734 SF. Gourmet kitchen w/subZero, AltoShaam & Rotissol appls. Huge window walls maximize the Mt Hood & valley view in every room. Main level master suite with luxury bath. Cool swimming pool, greenhouse, spacious shops, indoor & outdoor RV parking. Shop has 3-phase power + studio space. 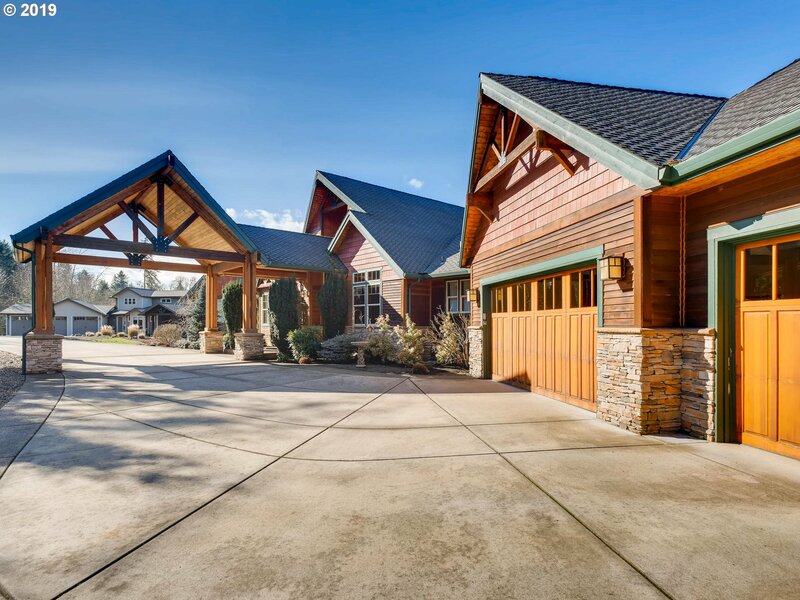 Live, work & play in your own private retreat.Easy commute to I-5"
"Stunning Sherwood Oregon Custom Craftsman Home with Mt Hood & St. Helen views on nearly 25 pristine acres! Open floor plan with vaulted ceilings, high-end appliances, master suite on the main, heated floors, large covered patio for entertaining. Enjoy your own year-round creek and natural spring with plenty of space for shop/barn, horses, possible vineyard and much more this close-in gem offers." 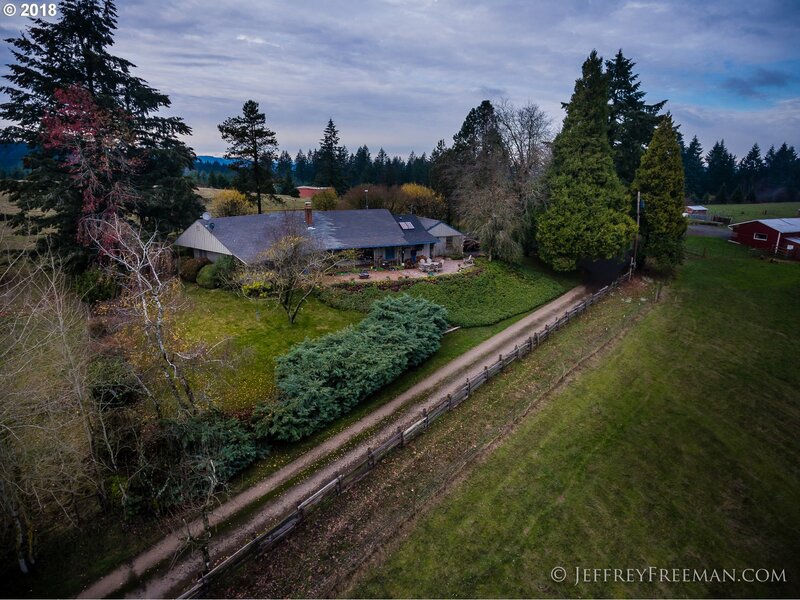 "Breathtaking, Secluded Country Estate with easy proximity to Sherwood, Wilsonville & Newberg. This immaculate home is an entertainers delight with open, spacious rooms & deck to enjoy mountain & territorial views! Chef's kitchen boasts custom cabinetry, generous granite counter space, double oven & more. Split bedroom design w/large bedrooms. 3 car attached garage plus agricultural bldg for tools & toys. Property in Timber deferral." "Private luxury estate w/elegant features throughout! From vaulted entry to formal entertaining in living & dining, & informal family & game rms w/sound systems, the spacious, practical floor plan provides ideal spaces for hosting or quiet evenings. Option for 4th bdrm w/main level office. Master bdrm w/dressing area. Interior awash in natural light w/stunning mountain views. Manicured 1.74ac lot boasts decks & patio w/outdoor fireplace!" "Enjoy breathtaking views from this extravagant craftsman home in the gated Parrett Mountain Estates. Towering great room ceilings, sprawling deck, main level and multi-generational living are just the beginning. The well-appointed kitchen features granite counters & gas appliances, while the downstairs boasts an additional family room, theater, music room & wine closet. Peace, privacy & luxury, all just a few minutes from Sherwood." "Custom & quality built newer construction on nearly 5 scenic acres. Enjoy thoughtful design & beautiful valley views on your private estate. Home features 20' wall of windows overlooking your well manicured lawn & beyond to your suburban farm and private trails. Kitchen features all Viking appliances w/ quarts & granite countertops & knotty alder cabinets. 2 master suites w/ private deck access. Minutes from Downtown Sherwood!" "Amazing custom Tudor Parrett Mountain estate, Spectacular home on 20 acres with a great floor plan. Hardwoods throughout, light and bright, upgraded lighting, huge bedrooms, sprawling master suite. lots of storage, 180 degree valley and mountain views, an amazing piece of land that is very usable, large shop with an apartment above and horse stalls. This one is amazing and will not last long!" "Contemporary custom built, neatly situated for privacy on 5+acres w/sweeping Willamette Valley views.Continuous floor to ceiling windows throughout w/dramatic soaring vaults.Open layout provides stunning light & ever changing seasonal views.Kitchen w/top end appliances leads out to entertainer's dream; sprawling outdoor living spaces, gorgeous built in pool/hot tub, surrounded by a professionally landscaped yard & garden.10 min to I-5." 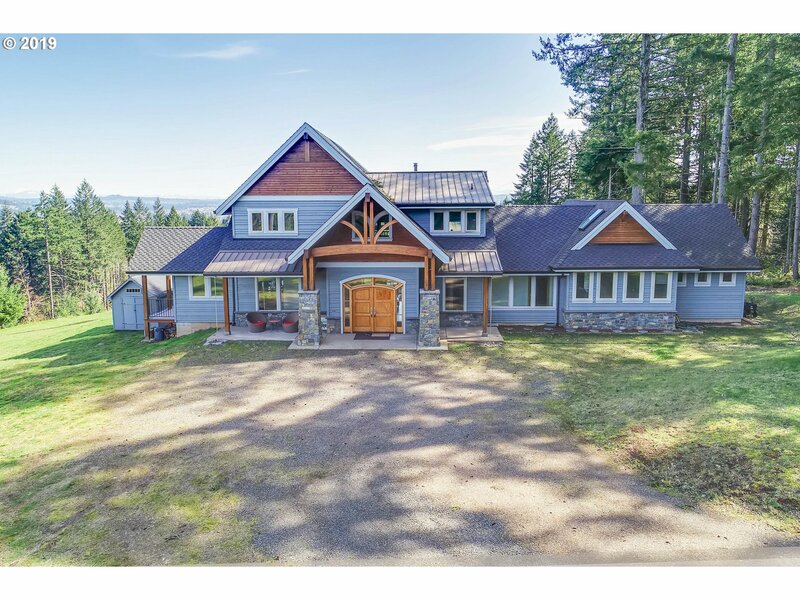 "Entertain in style in this gorgeous custom estate in the spectacular Chehalem Mountain wine country w/privacy, mountain & territory views! Long list of high-quality features, amenities & new updates. Well-appointed living spaces adorned in exotic hardwoods and beautiful finish work from the inside, out! From the beautiful grounds to the gourmet kitchen, no detail has been spared, there's even Comcast High-Speed Internet! (Broker owned)"
"BUILD A SECOND DWELLING.Historic farm property first settled in the 1850s, see history doc. The home has been maintained and upgraded over the years while keeping it's original character.20-30acs for grapes or other uses.Seller is a real estate broker in the State of Oregon.Remodel the main house and build your dream home with 360 degree views on the top of the mtn. Chehalem Mountain AVA.Water Rights.Guest house. NO SIGN!"